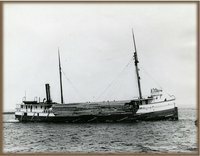 Shipwrecks in Lake Michigan - such as the Muskegon and the J.D. Marshall - are memorials to the Indiana's maritime history. The Indiana Lake Michigan Shipwreck Survey Project from Indiana DNR's Lake Michigan Coastal Management Program updated previous research about these nautical resources, conducted archaeological surveys, and reviewed best practices to develop a management plan to focus on conservation and allow public use. Contact the Lake Michigan Coastal Management Program at coastal@dnr.in.gov. Dive Video: Muskegon and J.D. Marshall shipwrecks (no audio). Dive Video: Material Service and Car Ferry No. 2 shipwrecks (no audio). The J. D. Marshall (12PR0723). Historic picture, view of vessel's starboard side with cargo of lumber, circa 1908. Used with permission, Great Lakes Marine Collection of the Milwaukee Public Library / Milwaukee Public Library. The Muskegon (12LE0381) [aka Peerless]. Historic picture, view of vessel's port side when it was a passenger vessel, circa 1900. Used with permission, Great Lakes Marine Collection of the Milwaukee Public Library / Milwaukee Public Library.